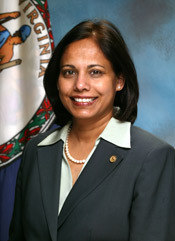 Manju Ganeriwala was first appointed State Treasurer by Governor Kaine in January 2009, and reappointed by both Governor McDonnell in 2010, and Governor McAuliffe in 2014. As Treasurer, she oversees the investment of over $10 billion in public funds; management of over $15 billion in debt; issuance of bonds; provision of banking services; and administration of the state’s insurance and unclaimed property programs. Ganeriwala also serves as the Chairwoman of the Virginia Treasury Board and is a member of ten other boards including the Virginia Port Authority, Virginia Resources Authority and Virginia Housing Development Authority. Ganeriwala has more than 30 years of experience in the public and private sectors. Prior to her appointment as Treasurer, she served as Deputy Secretary of Finance in Governor Kaine’s Administration, Chief Financial Officer for the Virginia Department of Medical Assistance Services and Associate Director for the Virginia Department of Planning and Budget. Her experience also includes strategic planning, mergers and acquisitions analyses, and long-range forecasting for the East Ohio Gas Company in Cleveland, Ohio. Ganeriwala holds a Bachelor of Commerce degree from the University of Bombay and a Master’s in Business Administration degree from the University of Texas at Austin. She is the 2009 recipient of the YWCA’s Outstanding Women Award (Government) and is a 2013 Toll Fellow. Ganeriwala is a past president of the National Association of State Treasurers and a recipient of the prestigious Jesse M. Unruh award recognizing her outstanding service to the association and profession. In addition, she received the Harlan Boyles-Edward T. Alter Distinguished Service Award. She is also a past President of the National Association of State Treasurers, and former Chair of the State Debt Management Network. In the March 2014 issue of the Governing Magazine, she was featured as one of twenty-five women chosen for the inaugural Women in Government Leadership Program.